Representatives for 20th Century Fox and Tatum could not immediately be reached for comment. “Gambit” has long been a passion project for Tatum, whose attachment encouraged 20th Century Fox to ramp up production. However, Tatum also has larger ambitions, which may play a role in the current situation. In a recent Grantland profile, Carolin said that he and Tatum are planning to make their directorial debut soon, so it’s possible that the star’s desire to segue behind the camera is factoring into his decision. The actor also slated to star in “23 Jump Street” for Sony. Tatum is represented by UTA and Management 360. This actress got her start on the catwalk. She's appeared in shows for Burberry, Jason Wu and Dolce & Gabbana. Delevigne's biggest roles are in "Paper Towns" and "Suicide Squad." The "Ted" actor, "Entourage" producer and former rapper showed off his buff body in underwear ads for Calvin Klein in the 1990s. The face of fashion luxury brands Burberry and Armani appeared in "Clash of the Titans," "Pusher" and "Electricity." Modeling since age 16, the British beauty posed for H&M and Burberry before playing Marlene in "Insurgent." The Texas native modeled as a child before she became known to TV audiences in "Gilmore Girls." She also starred in "Sisterhood of the Traveling Pants" and its sequel. The star appeared in fashion ads for Dior and Armani before transitioning into acting with roles in "Once Upon A Time" and "50 Shades of Grey." A Sports Illustrated and top model during the 1990s, Romijn gained popularity for starring as comic book favorite Mystique in the "X-Men" films. Cole was named "Model of the Year" by the British Fashion Awards in 2004 and starred in "The Imaginarium of Doctor Parnassus," "The Moth Diaries" and "Snow White and the Huntsman." Decker posed on the cover of Sports Illustrated in 2010 and moved on to roles in "Battleship" and "What to Expect When You're Expecting." This actress-singer has been modeling since the age of 12. Since then, she's appeared in numerous sci-fi and action films, including the "Resident Evil" series. This popular Victoria's Secret model went from donning wings to dodging evil robots in "Transformers: Dark of the Moon." She also starred in "Mad Max: Fury Road." Ratajkowski landed on Hollywood's radar as a dancer in Robin Thicke's "Blurred Lines" music video and then posed for Sports Illustrated's 2014 swimsuit issue. She upgraded to the big screen in "Gone Girl" and "Entourage." Prior to winning audiences over in "Step Up," "Magic Mike" and "Foxcatcher," Tatum was a high-profile model for Dolce & Gabbana and Emporio Armani. 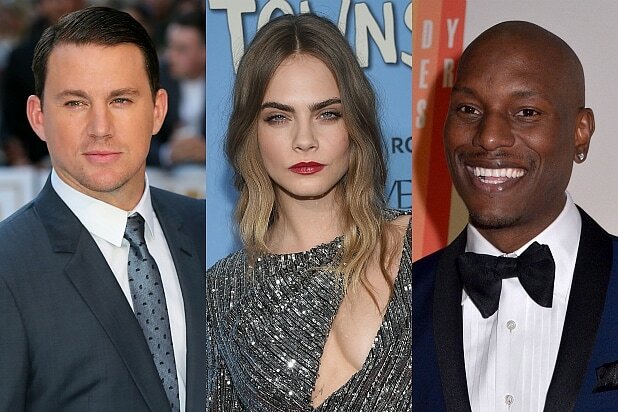 Also Read: Where Did the Boys of Summer Go for Channing Tatum’s ‘Magic Mike’ Sequel? The 2012 and 2013 Sports Illustrated Swimsuit Issue cover girl also appeared in "Tower Heist," "The Three Stooges" and "The Other Woman." The youngest model to appear on the cover of the American edition of Vogue, Ward played Tamara in "Pirates of the Caribbean: On Stranger Tides." Kutcher modeled for Calvin Klein before landing a role in "That '7os Show." He later made the jump to the big screen in "The Butterfly Effect," "Valentine's Day" and "Jobs." The model appeared in Vogue and Harper's Bazaar before scoring film roles in "White Chicks" and "Sin City." The classically trained actress -- and great-granddaughter of author Ernest Hemingway -- appeared in "Starlet" and "The People Garden" after a successful modeling career. The former model landed a breakout role in 2001's "Baby Boy" and appeared in the "Fast and Furious" franchise, including the recent "Furious 7." A powerhouse model in the 1990s, she is best known for "Austin Powers: International Man of Mystery" and "Bedazzled." After winning the Miss Israel pageant in 2004, the model made her on-screen debut in the fourth "Fast and Furious" film. Her next big gig is as Wonder Woman in "Batman v Superman: Dawn of Justice." A child model, the London-born actress earned Academy Award and Golden Globe nominations for roles in "Pride and Prejudice," "Atonement" and "The Imitation Game." The former Versace model is enjoying a successful acting career. His film credits include "Straw Dogs," "27 Dresses" and the "X-Men" franchise. After starting out as a model for Calvin Klein, she later carved out a successful acting career with roles in "Blue Lagoon," "Endless Love" and "Suddenly Susan." One of the top models in the 1990s and early 2000s, Banks went on to produce and host "America's Next Top Model" and starred in "Coyote Ugly." Before his role on hit television show "The Vampire Diaries," Somerhalder was a highly sought after model for Guess, Nautica and Versace. Diaz worked for Calvin Klein and Levi's before moving to the big screen. Her film credits include "Charlie's Angels," "There's Something About Mary," "Vanilla Sky" and "Shrek." Before appearing in "Mad Men" and "X-Men: First Class," the actress worked as a model for Abercrombie & Fitch. Before starring in "Benchwarmers" and "Yes Man," Sims got her start by being featured in Sports Illustrated Swimsuit Issues throughout the years. Before becoming a Hollywood hunk in "Twilight" and "Immortals," Lutz signed with Ford Models and appeared in underwear ads for Calvin Klein. Known for "Total Recall," "Basic Instinct" and "Casino," Stone was signed to Ford Models in her early career and decided to pursue acting. This former model worked for Tommy Hilfiger, Rocawear, Gap and Victoria's Secret. Her big break was in Denzel Washington's "Antwone Fisher." She also starred in "Honey" and "Get Rich or Die Tryin.'" Pettyfer got his fashion career started at the age of seven as a child model for Gap. Since then, he's landed roles in "I Am Number Four," "Magic Mike" and "The Butler."